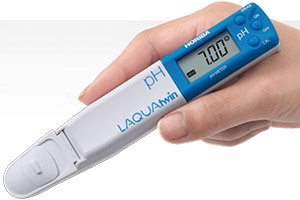 Horiba Compact Laqua Twin meter range for plant sap, water, soil water solution & more. Accurate measurement from only a single drop to HORIBA original flat sensor. LAQUAtwin’s easy, reliable and quick measurement of 7 parameters brings new dimension to your water quality testing. Accurate reading from only a single drop of sap, in a few seconds. Calibrate and measure at the touch of a button - the Smiley face will tell you when the result can be read. LAQUAtwin is fully waterproof and dustproof (IP67 rated). Note: not all LAQUAtwin models depicted may be available in every country. Contact the Meter Man - David von Pein to discuss your water quality, soil and plant health meter requirements. LAQUAtwin and HORIBA are registered trademarks of HORIBA Ltd, Japan.